Use Extra Wide Die-Cut Deco Trim® as a finishing touch on the edges of your bulletin boards, windows, doorways, chalkboards and dry erase boards. 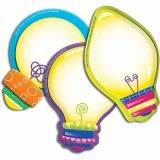 The vibrant colors and designs will add creativity to all of your classroom displays. 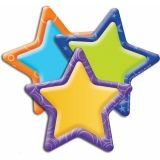 Eureka Cut Outs can add creativity and fun to bulletin boards, hallways, walls, projects and more. 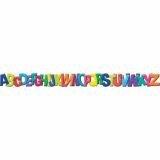 Various shapes and colors are great for decorating, writing the week's spelling words, student names or awards. These paper cut-outs have so many uses. 12 strips, 3-1⁄4"W x 37" each. Total of 37 feet. Everything needed to create a giant classroom calendar! With the brightest colors, individual designs and variety of styles, the choices are endless. Everything needed to create a giant classroom calendar, with month headings, dates and additional squares containing illustrations that highlight special days. 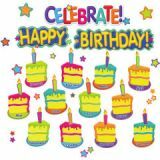 Includes 17" x 24" calendar, 12 month headers, 33 dates and 37 special day markers. 110 pieces. 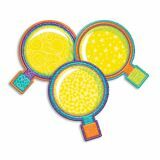 Use as a finishing touch on the edges of your bulletin boards, windows, doorways, chalkboards and dry erase boards. 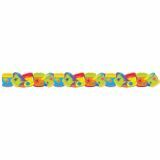 This colorful trim matches well with any classroom theme. 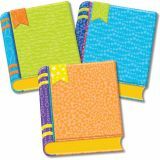 The vibrant colors and designs will add creativity to all of your classroom displays. 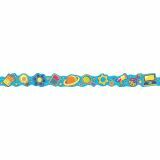 Contains 12 strips, each 37" long. Scalloped extra wide width 3.25". Teach your students the days of the week and month in Spanish! 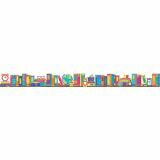 83 piece set includes: 1 Giant Calendar (34" x 24”), 12 Month Headings, 33 Dates, 37 Special Day Markers. Packaged as 4 17" x 24" panels. Coordinates with the Color My World collection. 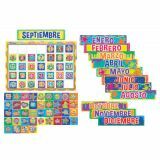 Welcome your class in Spanish with this 44 piece Eureka Bulletin Board Set. Set includes: 1 Welcome Pennant Banner (11 pieces), 13 Piece Birthday Set, 18 Piece Class Job Set, 1 Celebration Banner, and 1 Blank Frame. Packaged as 6 17" x 24" panels. Coordinates with the Color My World collection. Use Extra Wide Deco Trim to add a finishing border to your displays, windows, doorways or chalkboards. Vibrant colors plus a variety of styles and themes can add creativity to displays, windows, chalkboards and more. 12 strips per package each measure 3 1/4" x 37" for a total of 37 feet!